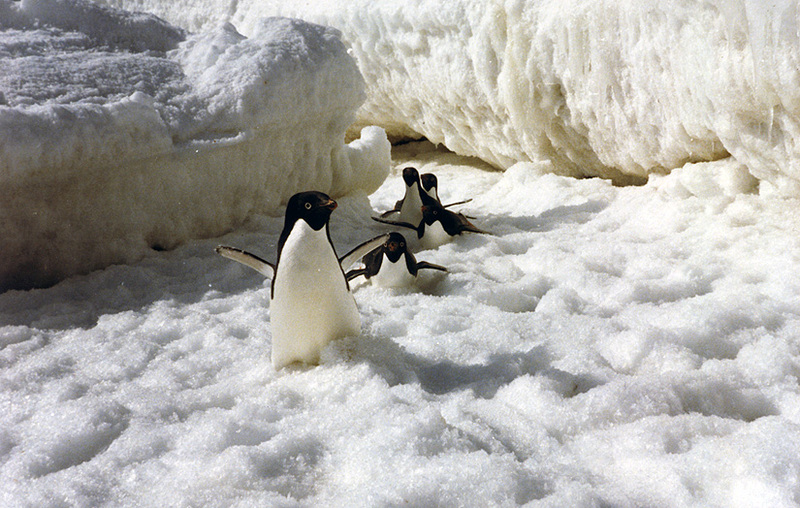 #These penguins were walking, waddling and tobogganing up and down the area beneath the ice foot looking somewhere to get out. So I thought I'd play a little trick, squat down out of view and wait for them to turn the corner - no I didn't jump up and shout "surprise! ", but the comic effect of the first bird's reaction to realising he was coming towards me at high speed is evident. Fortunately I managed to get this shot off and capture the moment before moving sea-wards (to the left) and allowing their progress to continue, they were back again a few minutes later though as all they could really do was wander back and forth while waiting for the tide to come in and raise them up to the right level.